A superb guitar that won't break the bank. Limited colours and no options available. 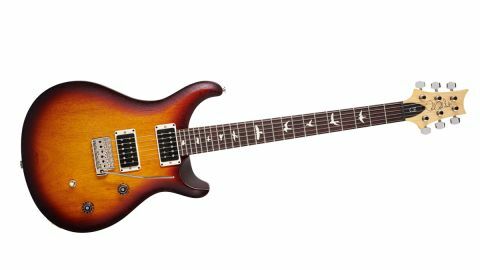 Early in 2016, PRS brought back one of its original 80s guitars, the bolt-on CE 24, with a full list price of £1,869. Not bad considering the flagship Core-level Custom 24 started at £2,939 at the time. Fast-forward to the last quarter of the year, however, and due to the pound-weakening fallout from the referendum, that CE 24 has risen to £2,110 at the time of writing, and the Custom 24 now kicks off at £3,300. Ouch. In an attempt to counter this rising trend, PRS has unveiled the CE 24 Standard Satin, an all-mahogany-bodied CE with a satin finish that drops in at a full retail price of £1,650 (with gigbag) in a trio of colours: Vintage Cherry, Charcoal (Black) and Tobacco Sunburst. It doesn't mention it in its name, but it's a limited model that could only be ordered by dealers between a tight window of 29 September to 31 October 2016. Should the model hit the spot, so to speak, it'll continue in the line. The CE 24 Standard Satin also sticks to the CE 24 formula pretty closely, the major change being the all-mahogany body, which means there's no natural maple edge 'binding', so the three colours wrap around the body. Irrespective of the price, there's plenty to like here. The CE 24 Standard Satin also sticks to the CE 24 formula pretty closely, the major change being the all-mahogany body, which means there's no natural maple edge 'binding', so the three colours wrap around the body. The neck here, like the gloss CE 24, is also natural: in short, a more bolt-on, Fender-like vibe. Depending on the process and the company applying it, 'satin' finishes can be quite different. Here, it appears to have no grain filler - certainly on the mahogany back of the recently-reviewed Ltd and the full body of the Standard - so you can see and feel the flecked wood grain. It's a very different vibe to the high-gloss of the standard V12 PRS finish. As ever, a satin finish will burnish to a low gloss with use, but is more susceptible to marking. If you like your guitars not only shiny but mark-free, this probably isn't the finish for you. It has a very working-guitar look and feel unlike the "OMG, don't touch that!" vibe of many of PRS's upper-level instruments. Scale length is standard PRS 635mm (25 inches) and the 'board has a 254mm (10-inch) radius, and while the profile does feel a little skinny if you're a Wide Fat player, it's very mainstream and feels really good. Intonation is as slick as ever with easy playability - few players will object. With only the 13mm slice of maple differentiating the Ltd and Standard models, we'd expect them to sound close, and while they both share a zingy acoustic response, the differences emerge when plugged in. The standard packs a round, woody, chunky voice. It doesn't have the depth of our reference 2016 McCarty; both our CE sounds crisper and rawer. The McCarty sounds like an older, plummier 'Gibson' compared with these new CE models' more hot-rod 'Fender' voice. The McCarty seems more stately, more 'dinner suit' jazz and blues; the CEs have got tighter jeans and longer hair! There's something very good about the voices we hear and, as we've reported before, these 85/15s seem to really let the guitar speak rather than over-colour the sound - which, to our ears, means there's exceptional versatility and extremely good dynamic range. Neither guitar has the low-end clout of a good single-cut nor the rounder resonance of a thinline, but with sympathetic amp voicings we can cover a lot of ground. It's probably correct to say that with guitars such as the PRS McCarty, and especially the McCarty 594, PRS has nailed the classic humbucking guitar. These CEs don't nail those bolt-on classic single-coil voices, but bearing in mind we have a dual-humbucker setup here, they certainly lean into a hot-rod Fender tone and then some. The CE 24 Satin Ltd looks and sounds like what the original CE became: a bolt-on version of the Custom, albeit with the newer acoustically enhanced PRS voice and the very open, classic-sounding but not midrange-heavy 85/15 humbuckers. And at this price, we should note that there's nothing wrong with that, not least that it's relatively collectible, too. But the Standard recalls the original and more Fender-style Classic Electric guitar before it became the CE - it's a little more woody. It's also the cheapest platform in which to access these 85/15 humbuckers, which really adds to its appeal. Factor in the fact that the street pricing will trim around £150 off, put simply, this CE 24 Satin makes a huge amount of sense.